Walter Burgess was “Running’s Everyman”. Walter completed his first Boston Marathon in April, 1988 and was to run over 26 marathons and countless running races and triathlons of varying distances. Walter loved to run for the pure joy of running. He was modest about his own many accomplishments and was the first one to support others’ goals and efforts in their own running. He was very active in his running club (Parkway Running Club), and worked as the club secretary and newsletter editor. A loyal American, he served four years in the U.S. Navy and worked for the Federal Post Office for 16 years. An avid traveler, he visited China, Vietnam, Thailand, the Fiji Islands, Australia, New Zealand and London, to name a few. These trips were often related to some running event he would be participating in. In 2003, he was training for the Great Floridian Ironman Triathlon in honor of his 40th birthday. Regretfully, he didn’t have enough vacation time and wasn’t able to come to the Newport Running Camp (now the American Running Camp) for the first time in 10 years. He was missed, and he promised he would be at the camp in 2004 to rejoin the group. In 2003, Walter successfully completed the Ironman Triathlon he was training for on October 25th, 5 days after his fortieth birthday. He swam 2.4 miles, biked 112 miles and ran a marathon-26.2 miles-in 15 hours, 46 minutes, and 32 seconds. His Dad and eight members of his running club went with him to cheer him on. He persevered through the swim, completed the bike and actually looked forward to the marathon!-because running was his strongest event and he enjoyed running marathons. Within a week following this event, he was already talking about signing up for another Ironman triathlon the following year to see if he could improve his time! He radiated total happiness with his accomplishment of completing the Great Floridian Ironman in honor of his fortieth birthday. Without warning, Walter suddenly passed away on November 10. He left a devoted family and friends behind-and a void that will never be filled. 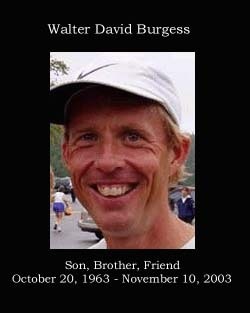 Please take a moment to read Running’s Everyman, A tribute to a runner who made the sport better by Don Allison, December 2003.